Annamma runs a “Dry Waste Collection Centre” (DWCC) in Bengaluru. DWCCs, one for each ward, are facilities meant to ensure that all the dry-waste of the city is collected separately and whatever can be recycled reaches the recycling markets. They were conceived and implemented by Bengaluru in response to a solid-waste management crisis the city faced in the first decade of the 21stcentury. 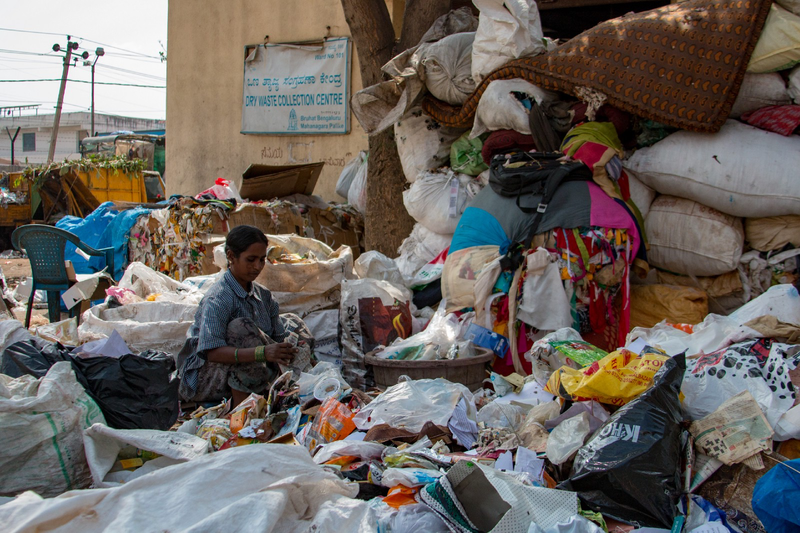 Annamma has been picking waste from the streets of Bengaluru since she was 10. 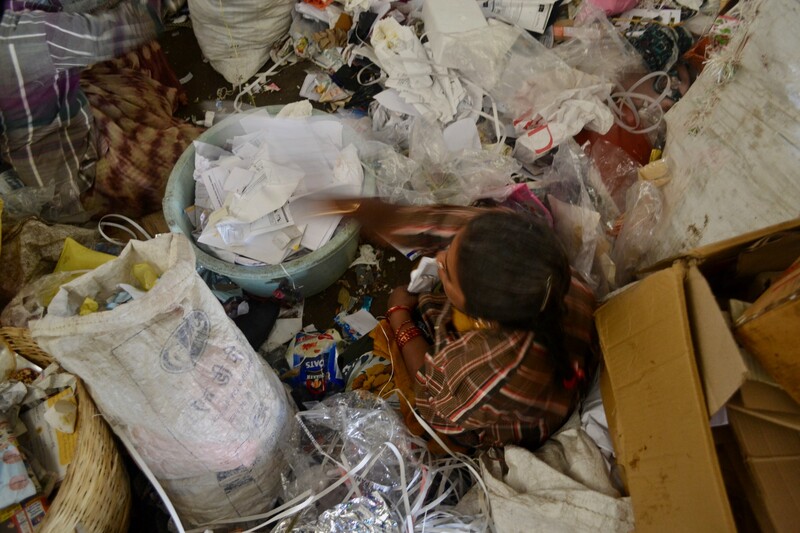 She inherited this livelihood from her grandmother’s generation and has been an informal waste picker ever since. 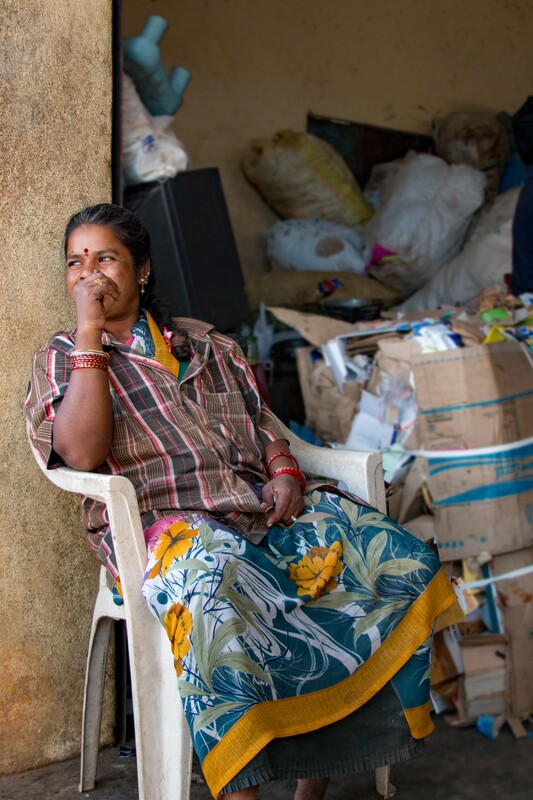 Around the time the DWCCs were emerging, Annamma became a member of a network of waste pickers and scrap dealers of Bengaluru organised by an organisation — Hasirudala. It is with Hasirudala’s help that this network of informal waste-pickers asserted the importance of their role in the city’s waste management landscape. Through this process, they have now been given some identity and the opportunity to operate the city’s DWCCs. They still have to operate the DWCC as a business and make ends meet through trading of recyclables. Something city governments have never done themselves. Annamma who is 30 something years old now has three girl children — one of them doing her degree and two others in school. “My girls sometimes do well and sometimes fail in their school classes but they will not get into waste work”, she says. “We as waste pickers have always done the work of keeping the city clean — we have helped the government by doing their work but have never received that recognition. We do not benefit from the health insurance, PF, ESI etc that other workers do” she adds. “As the city has grown, types of waste has grown and today the quantum of waste has greatly increased, our income has increased but so has our cost of living. Earlier nobody cared for us but since we began asserting for our recognition, we now at least have an official identity from the government” Annamma narrates. She continues, “when I first got the opportunity to run a DWCC I hesitated taking it up. I then told myself, this is the work I anyway I do — so I should take it up. I gathered confidence and decided to run it. Hasirudala facilitated allocating a DWCC to me from the Bengaluru government. I also got help from organisations like S3IDF to access loans that I need to run the DWCC. Still working here, especially doing door-to-door dry-waste collection for which the government should pay us is very risky. They haven’t been paid us yet for the last 12 months. Even after all this, we are still not their priority”. She adds, “If anyone would help me to learn how to read and write, I will somehow find time to learn. It would be wonderful”. During times in which jobs are seen to be scarce, does what Annamma is doing for her livelihood get counted as a job in official data? Should what Annamma is doing be counted as a job?. The Prime minister of India himself has pontificated on these questions. He famously made a statement that implies that the “pakoda seller” on the street is “employed”. In so doing, he appropriated the agency of the millions of Annammas of the country, the agency with which they cope with the underprivileged-ness of their lives, as the outcome of successful management of the economy by his government. He went on to say that “more than the lack of jobs, the issue is lack of data on jobs”in an interview to the Swarajya magazine denying any problems. This has set the contours of public-discourse within which the Indian intelligentsia debates the “truth about job creation in our current economy”on television prime time news. What these statements have also fuelled are narratives and counter narratives of the informal economy in India. Does India’s informal economy represent the ingenious entrepreneurship of people or is it the sad state of choice-lessness of the vast majority of the workforce? Are the forms of employment it creates exploitative and unsafe or is it a saviour for those who are underemployed or unemployed? Notwithstanding these questions, there is simply no contesting that close to 90% of workers in India are engaged in informal work with a large majority of them having low earnings with limited or no social protection. Are the contours of this discourse adequate to understand of how gainful stable employment for the vast majority of workers can be achieved? What goes into the transition from informal work to a formal stable job, the transition from informality to formality? In India the lines between livelihood and employment become fuzzy. The informal economy and the formal economy is a continuum. So is the transition from the informality to formality. It therefore becomes important to understand what the journey of the informal sector worker is — the Annamma’s of India -from informality and its associated vulnerabilities to livelihood security, well-being and growth that integrates them into the economy. Current public-discourse doesn’t discuss this journey at all. The current debate makes it seem like it is a matter of ‘counting correctly’ and the question of whether the informal should or should not be counted: the understanding of informality is econometric. From the perspective of the manager of the economy the annoying characteristic of the informal sector worker’s work is the way it defies forms of economic measurement: her enterprise is not registered, she is most likely not keeping a book of accounts and she does not pay taxes. Her relationship with her employees is again informal, without any written contractual obligations, “in defiance” of labour regulations. Her enterprise is also likely beyond the ambit of institutions that exercise other forms of regulation — such as pollution control or environmental regulations. Equally her enterprise and her workers have no access to different forms of social security leaving their lives very vulnerable to medical emergencies, accidents or environmental extremities (they bear the worst brunt of even the smallest droughts, floods and disease outbreaks). An informal enterprise and its workers are an econometricians nightmare. They exist but they don’t. They don’t become any form of data. This reflected itself in the Prime minister’s famous statements. The informal sector’s relationship with the state and the formal economy is however a complex political economy. For instance, while informal enterprise may not pay taxes, state actors seek some or the other form of rent from them — an informal transaction that officialdom itself indulges in. The street pakoda seller pays her daily hafta to the policeman. These rents add to the costs of the informal enterprise significantly. Another very important relationship is that the services of the informal sector fills the inadequacies of the state’s (and its formal private sectors partners’) public services (for which taxes are paid in the first place and which ironically often do not reach the informal sector workers). The sanitation and solid waste are example sectors — of which Annamma is one worker — where the informal sector practically subsidises the state — notwithstanding narratives of “nexus between politicians and contractors”, which shape the nature of the formal-informal continuum in these sectors. State policy, in its enthusiasm to foster investment and ensure economic growth, in its intent to make the country more “formal business friendly”, often spurs informalisation of workforce — a trend that has been clearly established as true at least for the first decade of the 21stcentury in India. Of course the state also constitutes policies and programs that seek to address some aspects of social security, skill development and access to credit to supposedly help the vulnerable informal sector workforce — but the implementation of these is far from adequate and mostly insensitive to their social contexts. Neither the econometric narrative nor the political-economy narrative of informality however captures the very crucial social narrative of informality — an extremely critical element to recognize in the journey of an informal sector worker from informality to integration. Very significant swathes of the workers in the informal sector — be they just workers or “proprietors of enterprise” — often have a history of social stigmatisation themselves or are from sections of society who have historically been stigmatised. This is a combination of a stigma based on caste and (increasingly, especially in urban areas) class. For an informal sector worker to become a formal entrepreneur — that’s the romanticised journey that the ‘Mudra loans’ seek to enable — the first step, the most difficult one, is the reinvention of the informal worker in her own eyes: the restoration of self-esteem and self-confidence. This is the beginning of a transformative journey. The stories of transformation of informal sector workers becoming successful formal entrepreneurs are also equally stories of social engagement and support. These forms of support may have come from individuals or organisations. They are also stories of solidarity and a shared aspiration amongst different informal workers with a common occupation or social stigma coming together and overcoming social and economic hurdles with support from each other. And solidarity is the most powerful transformative tool women have historically used — after all the informal sector is constituted very significantly by women and its vulnerabilities are disproportionately borne by them. Often these forms of collectivisation are enabled by civil society organisations and networks. This social engagement is necessary for any economic measures of support to really bear fruit — its importance is however hardly recognized in both discourse and policy implementation. The current managers of the economy (be they the politicians or their economist accomplices), have clearly used their power and policy instruments (in the name of reform) to “reign in” the informal into the managers’ ambit of regulatory and policy influence. Their obsession is with the econometrics of change rather than the journeys of transformation. National media discourse also plays into this obsession. However, does Annamma merely registering her entity (and bearing all the compliance costs even if she could) reflect the real journey that Annamma is still making? Shouldn’t it be the questions that Annamma has for the economists that should reflect itself in these debates and discourses? It is only when we begin to understand what this journey means will economic development have any meaning in India. Especially to the informal sector workers who constitute 90% of our labour force.